Want to have some fun – a different kind of running experience? Explore your limits! Check out the Susitna 100 miles in Alaska. “Race through remote forests, and frozen rivers and lakes in Alaska on Foot, Bike, or Ski, the choice is yours.” It is a qualifier for the Ultra-Trail du Mont-Blanc®. Here’s an excerpt from Daniels’ Running Formula with permission of the publisher, Human Kinetics. “A good measure of how much work you’re doing as a runner is how much distance you’re covering. It costs just about the same amount of energy to run eight miles in 40 minutes as it does to run eight miles in 60 minutes; you’re doing the same amount of work–only the rate is different. However, the amount of work (mileage) that you’re performing represents only part of the stress to which you’re subjecting yourself. Slower runners spend more time accumulating the same mileage covered by faster runners, and more time on the road means more footfalls, more landing impact, and a greater chance for increased fluid loss and elevated body temperature. Thus, although mileage achieved is a logical starting point, it’s also useful to keep track of total time spent running. Keep track of your weekly mileage so that you can use this record as a basis for how much of the various types of quality work you do and so that your training is consistent. Just as you use your current VDOT or (based on current racing ability) to guide your training intensities, you can use your current weekly mileage to set limits on quality sessions–but use time spent running to log points accumulated at various intensities of running. 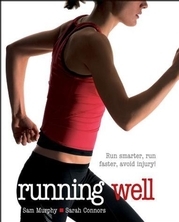 In the case of weekly mileage, remember the principles of stress and reaction (principle 1, page 8) and diminishing return (principle 5, page 12) I discussed in chapter 1. Stay with a set amount of mileage for at least three weeks before increasing your mileage. This gives your body a chance to adjust to and benefit from a particular load before moving on to a more demanding one. When it’s time to increase your mileage, add to your weekly total as many miles (or one and a half times as many kilometers) as the number of training sessions you’re doing each week, up to a maximum of a 10-mile (15-kilometer) total adjustment. For example, after at least three weeks of 20 miles per week spread over five training sessions, your maximum increase should be 5 miles or 7.5 kilometers–1 mile (or 1.5 kilometers) for each of the five sessions you’re doing each week. In this case, you would be moving from 20 to 25 miles per week. A runner who’s doing 10 or more workout sessions per week could increase his or her weekly total by 10 miles, after spending at least three weeks at the previous amount. Let a 10-mile (15-kilometer) weekly increase be the maximum mileage change, even if you’re running two or more daily sessions seven days a week. Another way of dealing with increases in weekly training load is to add to the weekly total the lesser of 60 minutes per week or 6 minutes multiplied by the number of training sessions you undertake each week. Signs you need to rest? Understanding the difference between being tired, fatigue, and over-training is important to progress in training. Here’s a very helpful excerpt from “The Runner’s Edge” that might help. It’s published with permission of Human Kinetics. “Managing fatigue by reducing your training as necessary is one of your most important responsibilities as a competitive runner. Fatigue is a symptom of incomplete physiological adaptation to recently completed training. When fatigue persists, it means that your body is not benefiting from the hard training that is causing your fatigue. A day or two of soreness and low energy after hard workouts is normal and indeed much preferable to never feeling fatigued, which would indicate that you weren’t training hard enough to stimulate positive fitness adaptations. Extended recovery deficits, however, must be avoided at all costs. You can minimize the need for spontaneous training reductions simply by training appropriately. Don’t ramp up your training workload too quickly (obey the guideline of 5 CTL – chronic training load-points per week), don’t try to do more than three hard workouts per week, follow each hard day with an easy day (featuring an easy run, an easy cross-training workout, or complete rest), and plan reduced-workload recovery weeks into your training every few weeks. Even if you take these measures, however, you will, assuming you train as hard as you can within these parameters, find yourself sometimes feeling flat on days when you had hoped and expected to feel strong for a harder workout, or find your fatigue level building and building over several days. At these times it’s important that you listen to your body and reduce your training for a day or two or three to put your body back on track. Technology is no substitute for your own perceptions in these cases. No device can measure your recovery status and readiness to train hard any better than your own body can. When your body is poorly recovered from recent hard training, you can always feel it. And when factors outside of your training, such as lack of sleep or job stress, compromise your capacity to perform, you can always feel that. Before you even lace up your shoes, you know that you’re not going to have a good day because of the heaviness, sluggishness, soreness, or low motivation you feel. Your body itself is an exquisitely crafted piece of technology whose primary function is self-preservation. One of the most important mechanisms that your body uses to preserve your health through hard training is a set of symptoms of poor recovery (those just named) that encourage you to take it easy when that’s what your body needs most. It’s important that you learn to recognize these symptoms and get in the habit of obeying them. Pay attention to how your body feels before each workout and then note how you perform in the run so that you can discern patterns. Through this habit you will develop the ability to anticipate when it’s best to reduce workouts or take a day off and when to go through with planned training. A second way to use technology in determining whether and when you need a rest is to note where especially poor workouts and stale patches of training tend to fall in relation to your ATL, CTL, and TSB. Specifically, on days when you have a harder run planned and you expect to feel ready to perform well but instead you feel fatigued and have a subpar performance, note your present ATL, CTL, and TSB. The next time these variables line up in a similar way, you will know to expect lingering fatigue and can alter your training accordingly. Don’t expect to find 100 percent predictability through this exercise, however, because many other variables factor into your daily running performance that these variables do not capture.